Land Prep and Planting Happening This Week! Farms at Work is excited to announce an important seed-saving project in partnership with local youth education organization TRACKS, and Haudenosaunee grower Ieiérhes Karolyn Givogue Grant. Together, FAW and TRACKS will be caring for a variety of indigenous corn seeds, which are approximately twenty years old, and predate GMOs. This week we will be preparing the planting site at the Trent Experimental Farm, and getting the corn seed in the ground! The aim of this project is to grow the seed out in order to preserve its genetics, as well as to engage local Indigenous youth in a community garden project. Throughout the season, young people will learn about the Three Sisters (corn, beans, and squash); the pollination systems of corn, bean and squash plants; and participate in traditional celebrations related to the growing and harvesting of corn. As it will largely be Anishinaabe youth engaging with Haudenosaunee seeds, we will also explore concepts of cross-cultural sharing and migration, with the hope of returning these landraces to their homelands for similar garden programs after the initial pilot project. These Northern flint corn seeds originally come from Mohawk communities in Ontario and New York State. The seed was grown and collected during a study conducted by the Indian Agriculture Program of Ontario in the early 1990s. Since then, they have been stored in a freezer in an effort to maintain viability. Trent University professors Dan Longboat (Director, Indigenous Environmental Studies Program), and Tom Hutchinson have been the stewards of the 35 landraces ever since. 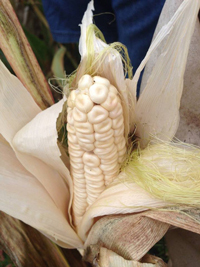 In our attempts to revive the corn, we will be growing and saving seed from only a few of the landraces. Thus far, germination testing has shown between 5% and 45% viability, which is promising considering the seeds have been in a freezer for twenty years. If you are interested in learning about Haudenosaunee agriculture, participating in seed-saving initiatives, or just want to spend some time getting your hands dirty this summer, we would love your help! We are looking for volunteers to help in the preparation of mounds for the Three Sisters, maintaining the plot throughout the summer, and providing support for workshops with youth. If you are interested in being involved, please get in touch. Support for this project is provided by The Bauta Family Initiative on Canadian Seed Security, a project of USC Canada delivered in partnership with Seeds of Diversity Canada and supported by The W. Garfield Weston Foundation. We would also like to acknowledge and thank the Trent University Experimental Farm for their support in providing the land for this project. Producers who attended yesterday's tour of the new Ontario Agri-Food Venture Centre were given a first-hand glimpse into the nearly limitless possibilities for value-added production soon to be available in east central Ontario. Thanks to the efforts of the Regional Local Food Business Rention and Expansion project (a collaboration of 9 jurisdictions across eastern Ontario), farmers and local food entrepreneurs will soon have access to shared infrastructure designed to help grow their businesses. The first of its kind in the province, the non-profit OAFVC has been built with farmers in mind, to help increase farm revenue by supporting opporunities for adding value to fresh fruit and vegetable crops. The new 15,000 sq. ft. facility, located in Colborne, ON, houses industrial equipment for cooking, chilling, freezing, packaging, and labelling, available for producers to rent on a cost-recovery basis. Also available will be short-term cold storage space (for both refrigerated and frozen items); meeting and office spaces; and food processing expertise from regional educational institutions and on-site staff. Producers wishing to utlize the facility must first complete food safety - food handling certification, as well as training on the peices of equipment they wish to use. Rooms and equipment are rented on an hourly basis, generally to one producer at a time (though to cut costs, multiple producers may opt to share timeslots). Bookings will be arranged through the online Facility Schedule, and producers are encouraged to consult with site staff about their processing requirements before arranging their first booking. Staff at the small-batch, niche processing facility are currently eyeing an opening date in mid-June. For full details about the facility, visit oafvc.ca. FAW is open to considering another tour, so if you would be interested in seeing and learning about the plant before it opens, please let us know. 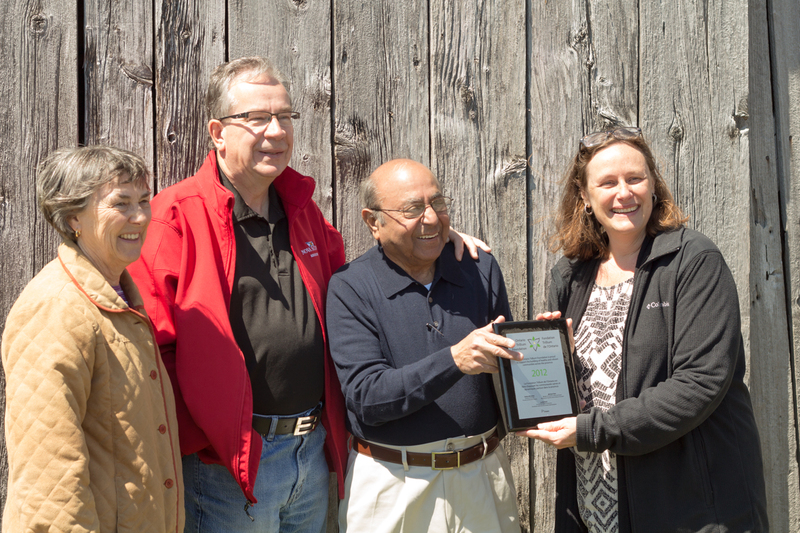 This past Saturday, FAW welcomed Ontario's Minister of Agriculture, Food and Rural Affairs, and Peterborough MPP Jeff Leal, as well as Dr. Ramesh Makhija, an Ontario Trillium Foundation (OTF) volunteer, and Mayor of Selwyn Township, Mary Smith, to Rocky Lane Farm to learn about our achievements, and to formally recognize and thank OTF for their generous support over the last three years. In 2012, FAW received a three-year, $192,300 grant to develop innovative programs that would help to revitalize rural agricultural communities in east central Ontario. While at the farm on Saturday, MPP Leal and Dr. Makhija had the chance to learn more about FAWs Sheep Farming Mentorship Program. FAW’s mission is to promote healthy and active farmland in east central Ontario, a region that has seen long-term declines in the numbers of farmers and farm businesses. Since 2009, we have worked to reverse these trends, by providing high quality training and business development opportunities for new farmers, as well as programs to help established farmers and non-farming land owners achieve stewardship goals on their land. By the end of the 2015 season, more than 50 “mentees” will have completed an FAW Mentorship in either Beekeeping, Sheep Farming, or Pasture Management. With the expansion of their initial model (beekeeping) to now include other types of farming, FAW has been approached by commodity organizations interested in rolling programs out in other areas of the province. 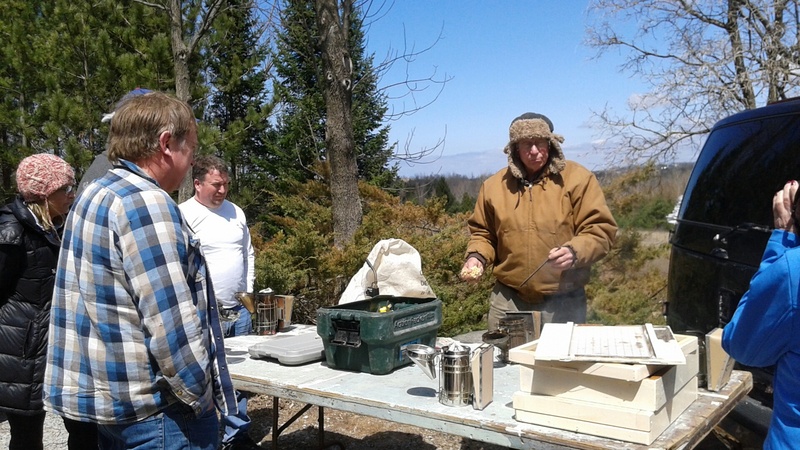 Starting this fall, the new Maple Syrup Production Mentorship will be held near Campbellford (registration now open). Farms at Work (FAW) was founded in 2009 as a charitable project on Tides Canada’s shared platform, which supports on-the-ground efforts to create uncommon solutions for the common good. Tides Canada is a national Canadian charity dedicated to a healthy environment, social equity, and economic prosperity. A leading grantmaker in Canada, the Ontario Trillium Foundation strengthens the capacity of the voluntary sector through investments in community-based initiatives. An agency of the Government of Ontario, OTF builds healthy and vibrant communities. Mentees in our on-farm mentorship programs have all been out in the field recently, with the kick-off of our 2015 mentorship season! So far in the last month, we've held field days for the returning Beekeeping and Sheep Farming Mentorship programs, as well as the newly launched Pasture Management Mentorship program. If you'd like to learn more, visit our Mentorships Program page, where you can find out all about the Beekeeping, Sheep Farming, and Pasture Management Mentorships, as well as our upcoming Maple Syrup Production Mentorship (beginning in the fall of 2015 - applications available now!). Trent University was ahead of the pack when they put out a Request for Proposals in 2013 for a five year food services contract that made increasing procurement of local food a priority. The contract was awarded in 2014 to Chartwells Education Dining Services, and specified that 50% of the food would be Ontario-grown, 35% of which must be sourced within 250km, and 2% of which must be sourced from within the Kawartha Region. With limited direct connections to local producers, Chartwells General Manager Carolyn Bennett reached out to Pat Learmonth, Director of Farms at Work (FAW), for assistance. Farms at Work is a non-profit charitable project of Tides Canada Initiatives, with connections out into the local food community across east central Ontario. Bennett and Learmonth toured farms and dairy processing plants over the course of the fall, and talked about the challenges and opportunities for institutional procurement. One challenge was verification of the origin of the products, which the University would need to satisfy the contractual requirement. After visiting local processors, Kawartha Dairy and Empire Cheese, Chartwells was interested in including dairy products in the local food mix. The real challenge would be determining precisely how far the raw milk had travelled before arriving at these local plants. Enter Dairy Farmers of Ontario (DFO), the provincial-level commodity organization that oversees the supply management system for cow milk in Ontario. Under this system, raw milk is picked up from the farms and delivered in the most efficient way available to a processing plant. As a result DFO has the computerized delivery and traceability data available that would support verification of origin. Over a period of several months, Farms at Work and DFO worked together to develop standardized Statement of Origin of Raw Milk. The first two Statements were completed in April 2015 for Empire Cheese and Kawartha Dairy. Armed with this new information, purchasers will now be able to buy dairy products from local processors, knowing where the primary ingredient – the raw milk – comes from. Trent University should be proud of its leadership in setting targets to support the local economy - and students at the school will soon be able to rest confidently in the knowledge that their next plate of mac ‘n cheese will be in direct support of local dairy farms.